[Updated] In September 2010, there was a general election to the Swedish parliament. Once again, it was expected that this would be the election in which social media would prove to have a strong influence on opinion. The jury is still out on what the real effects were, but most political parties and many politicians were active with blogs, on Twitter and on Facebook. Since then, Twitter and Facebook have continued to grow at amazing speed. Twitter now has more than 200 million users who publish some 250 million tweets per day. One would like to believe that the importance of Twitter as a communications channel has grown even more during the last 12 months. But apparently some think it is too much work to pay attention to what is being discussed on the microblog. The Swedish Liberal Party, which was the fourth largest party in the last election and is currently part of the ruling centre-right coalition, yesterday announced they were no longer going to log on to Twitter, at least not for a while. “We are now logging off from Twitter for a while. We don’t have enough personell to sit and monitor this channel. If you want to continue discussion [sic] you’re welcome to do it on (link to Facebook page)”. As I noted in this analysis of Swedish political parties on Twitter, the Liberal Party was the last of the established parties to start using Twitter. The account was registered in January 2009, but while all the other parties started tweeting during that period, the Liberal Party didn’t start tweeting actively until November 2009. Now, they are also the first to leave Twitter, if only for the time being. The account currently has 4,133 followers but it has only been active in periods. It went almost silent after May this year, with the strange exception of two days in October. 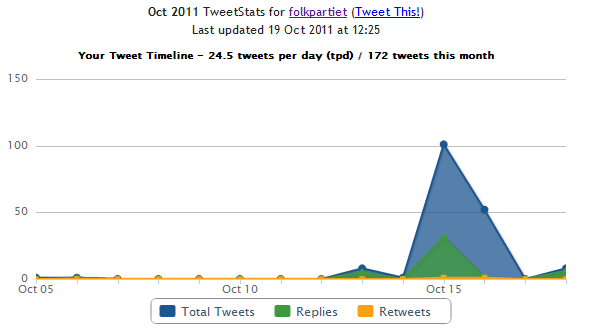 During the party’s national congress, it sent out 150 tweets in two days. Only two days later, it is announced that the party is logging off. 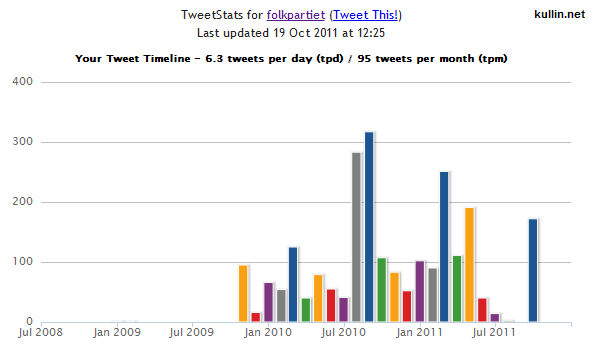 Below: number of tweets in October 2011. If find it interesting and a bit surprising to make such a move, especially since we are seeing more and more evidence that Twitter is at the heart of movements such as Occupy Wall Street and others. Twitter is and will continue to be a great place for interacting with opinion leaders and to bring forward political views. As a party, it will be at your disadvantage to log off for longer periods of time and try to come back when there is an election coming up. You can’t start to build relationships when you need them. They need to be cultivated over time. Update: When people started commenting about this on Twitter (?! ), the Liberal Party felt a need to clarify that they have not abandoned Twitter entirely. They are reorganizing and will still use the account, although “not as frequently as they would wish”. Hi Russell, not really. Now and then you see some companies that decide to shut down a channel, like UK airline Jet2 ( http://www.tnooz.com/2011/01/20/news/jet2-turns-off-twitter-account-highlights-reality-of-social-media/ ) but I can’t think of a company that has decided to leave social media entirely. Thanks for your help Hans! Previous Previous post: Media Culpa is one of 10 PR Blogs with Chutzpah!